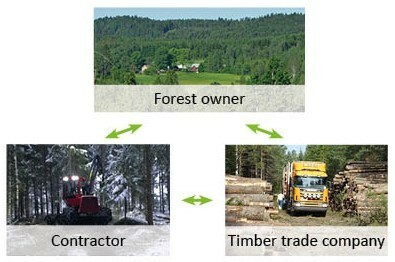 ECSkog contribute to a long-term and sustainable eco-forestry. Our contractors makes it possible to develop the forest product value in a sustainable society. Certification of forest contractors according to the PEFC standard, the tool creates the certified forest owners and felling organizations need to manage their forests. The contractor that is certified is making the PEFC standard to their standard. Certified small forest owners also need certified contractors. Certified contractors are an essential link in the Swedish wood trade chain, from the forest owner to the consumer of wood products. Certified contractors are trained to perform logging operations according to the standards and demands of both PEFC and FSC. To certify their companies is voluntary. For PEFC-certified forest owners and wood procurement organisation, it is a certification requirement to use certified contractors for execution of forestry services. At a first meeting, the certification standard is reviewed and we pass out the parts relating to the company concerned, what is clear and what must be corrected prior to certification. The auditor will come back and do a certification audit. When the auditor concludes that the company meets the standard requirements, contract are signed for contractor certification.